If you are in the market for a new mouse, you may have come across some options that are described as ergonomic. If you are not sure what that means, then let us explain the importance of choosing an ergonomic mouse. Ergonomics is the name given to the branch of science that studies how human movement interfaces with the tools we use. It has produced a vast body of research to show how equipment can be designed to be as efficient and comfortable as possible. An ergonomic mouse is designed to take account of this valuable information, resulting in a product that feels comfortable to use, even for extended periods of time. 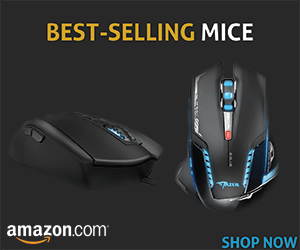 Sure, if you are looking for a cheap mouse, there are many options on the market. But it could turn out to be an expensive mistake when it comes to your health and well being. It may just be a humble mouse, but if it has a poor ergonomic design, this can lead to well-documented health problems. You may have experienced aching fingers and a sore wrist after a long session using a mouse. Long-term, these symptoms can develop into more serious and potentially life-changing conditions such as Carpal Tunnel Syndrome and Repetitive Strain Injury (RSI). That is why you should choose an ergonomic mouse. 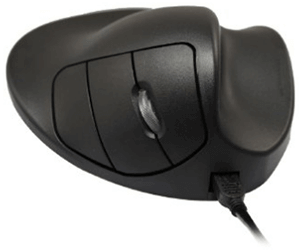 We have tested some of the best selling ergonomic mice on the market for size, shape, button placement and ease of movement. These reviews include some vertical ergonomic mouse options that you may wish to consider. [Score: 10/10] The M570 is Logitech’s best selling ergonomic mouse, and from the moment you take it out of its box, you can see why. It is beautifully sculpted to fit the palm of your hand, and all the buttons are within easy, natural reach, without straining your fingers. Being a trackball mouse, it has the added advantage of needing less desktop space. In fact, you don’t even need a desktop. You can use it in bed, or sitting on the sofa, as the unit itself remains stationary – it’s just the trackball that moves. The wireless receiver plugs into an available USB port, and the wireless range is up to thirty feet. The receiver is so tiny that you could easily leave it in your laptop while travelling, without any problems. It’s also handy to know that it is one of Logitech’s so-called Unifying receivers, which means that you can connect up to six compatible devices at once. Logitech claim that the M570 will run for eighteen months on just one AA battery (supplied), and there is even an indicator light that warns you when the power is running out. If you are willing to consider a trackball design, then this is a strong contender for the best ergonomic mouse available. 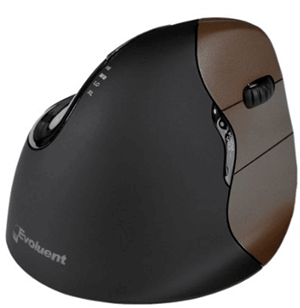 [Score: 9.8/10] This is Evoluent’s offering for the best vertical ergonomic mouse crown. 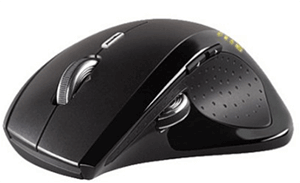 The VM4RW designation means it’s a vertical mouse, regular size, right handed, and wireless. There are other models in Evoluent’s range that may suit you better if you have larger or smaller hands, are left handed, or prefer a wired model. The Evoluent VM4RW has laser movement detection, and being a vertical ergonomic mouse, the idea is that it supports your arm, wrist and hand in an upright, neutral position. This allows extended and long-term use without aches, pains or strain. It does feel great in your hand. It has almost a sticky feel to it, which makes it easy to grip with little effort, and the base is flared so that you can rest your entire hand on it, without your little finger dragging on your mouse pad. Additional features include buttons that allow you to adjust the pointer speed. The mouse even has a display indicating the current speed setting. In practice, that allows you to achieve a lot of pointer movement with minimal wrist work. This is one of the more expensive ergonomic mice that we tested, but this is reflected in the build quality, which is excellent. [Score: 9.7/10] Also from Logitech, the cordless MX Revolution boasts precision laser technology and a distinctive shape that suggests ergonomics has played a major part in its design. 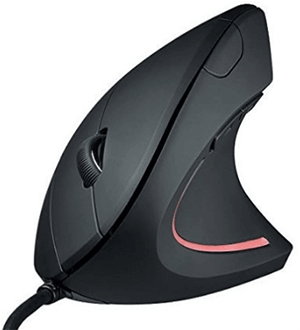 This mouse is cleverly constructed to feel great whatever size hands you may have, whilst still allowing easy access to all the buttons and the scroll wheel. On the subject of that scroll wheel, Logitech has come up with an ingenious concept: a free-spin mode. You have the option of using the scroll wheel ratchet by ratchet, to move line by line through documents and spreadsheets. But with a single flick, the alloy wheel spins for up to seven seconds, allowing you to fly through hundreds of pages at once, stopping precisely wherever you want. This contender for best ergonomic mouse includes a number of unique added features. For example, a dedicated button display results from your chosen search engine for a highlighted word or phrase. An additional wheel provides a way to flip quickly between documents or applications. Logitech’s “SmartShift” technology changes the way the scroll wheel works to suit the task you are engaged on. The power is sourced from a rechargeable li-ion battery. A charging station is included, and the mouse also boasts a four-stage battery meter. [Score: 9.5/10] We tested the right handed, wired, small version of Prestige’s unusually shaped mouse. There are other versions for left-handers and those preferring a wired model. Not just unusually shaped, but unusually named, too! This company, from Holland, have taken the Dutch word for glove, which translates as Handshoe, and it’s true that their ergonomic mouse does fit like a glove, with your hand and each of your fingers totally supported in what feels like a relaxed, neutral position. This is not a vertical mouse, but instead is set at a 25 degree angle to the supporting surface, which Prestige claim to be the ideal elevation for wrist comfort, based on their ergonomic research. In combination, these design features ensure full support, to the extent where there is absolutely no contact between your hand and the desktop whilst you are using it. This wireless version comes with a rechargeable, long lasting battery, and both the mouse and the battery are covered by a three-year warranty. [Score: 9.5/10] This is a sister product to the Evoluent VM4RW reviewed above, the main difference being that this is the wired version, connecting to your computer by USB cable. One of the most obvious differences – apart from the presence of the cable – is that without the heavy rechargeable battery on board, this wired version feels a lot lighter to handle, which someone suffering from carpal tunnel syndrome or RSI may see as quite a big advantage. 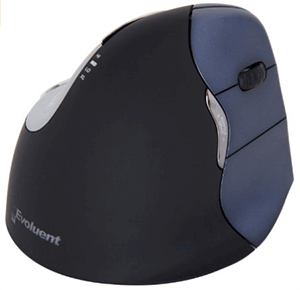 We found the Evoluent VerticalMouse VM4R very comfortable and easy to use. Whether or not you have yet been converted to love the vertical option for your mouse is down to personal preference, but Evoluent has been at the forefront of vertical ergonomic mouse design for many years. This latest model appears to have a shape that has been very well thought-out, combining comfort with the ability to reach all the buttons easily and without straining and twisting your fingers. Because of the way the thumb rest is designed, this ergonomic mouse keeps all your hand and fingers off the work surface, thanks also to the wide base that is also seen on the wireless version. Pointer speed is adjustable, and there is an LED display to show the current setting. 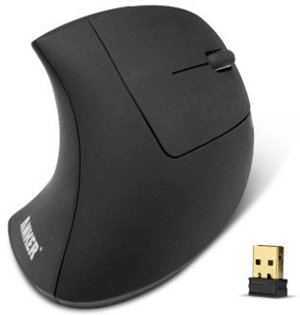 [Score: 9.3/10] One of the new generation of vertical mice, the Anker 2.4G has been ergonomically designed to encourage optimum arm and wrist positioning. In practice, this means that your arm and hand are positioned as though you are shaking someone’s hand. This posture has been proven to reduce strain, and allow for smoother movement of the mouse. Anyone used to the traditional horizontal mouse might find this offering from Anker takes a bit of getting used to, but there is no doubt that right from the word go, it feels comfortable and natural. In fact, going back to a conventional mouse, after using a vertical ergonomic mouse like this, feels quite awkward and unintuitive. The Anker 2.4G has the usual buttons you would expect on a mouse, plus next/previous buttons that are useful for web page browsing. All the buttons feel well made, as does the main shell of this ergonomic vertical mouse, with a nice, soft, rubbery non-slip finish. Another useful feature is the adjustable sensitivity setting, which provides more sensitivity than many other optical mice. This is a definite contender for the title of the best vertical ergonomic mouse. [Score: 9.1/10] This vertical ergonomic mouse comes in at a budget price, but first impressions are that, while it looks and feels a little weird, this is a decent piece of kit. The twelve month warranty should also put your mind at rest that build quality is fine, even at this price point. Powerlead seem to be building a good reputation, and offer after-sales support on all their products. The optical sensor on this model is adjustable for accuracy and responsiveness, and it also features additional thumb buttons like those normally found on more expensive models. Unusually, this mouse is supplied with a mouse pad and removable wrist rest, which you may or may not find to your liking. It runs off two AAA batteries which last quite well, thanks to the Auto Off function that kicks in after a few minutes of inactivity. While this mouse may not be everyone’s first choice for the best vertical ergonomic mouse, at the budget price and with a twelve-month warranty, you will be hard pushed to find a better value. 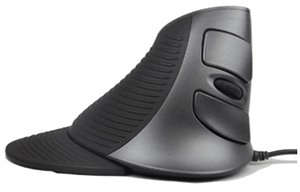 [Score: 8.7/10] Well, it’s not hard to guess how they came up with a name for this vertical ergonomic mouse! Shaped like a shark’s fin, it has a striking appearance, which the company says is the result of intensive ergonomic research. 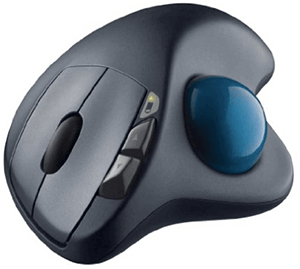 There is no doubt that the way your hand is positioned on this mouse feels very natural, and you could imagine using it for hours without any tension or fatigue. Like other best vertical ergonomic mouse models, this one allows you to adopt the “handshake” posture, meaning less strain on your arm, wrist and fingers. The Sharkk has easily adjustable settings for tracking speed, ranging from 800 to 1600 DPI. Those high sensitivity settings are great for people with existing wrist problems, as they can give you maximum pointer movement from minimal wrist movement. It also features next/previous buttons for web surfing and other activities, and the solid, step-by-step scroll wheel feels particularly accurate Although this is a budget priced vertical ergonomic mouse, it comes with a twelve month manufacturer’s warranty, and the build quality feels very solid, with a nice, rubber-like finish for good grip. Do you have more to add to this list? Feel free to write it in the comments.